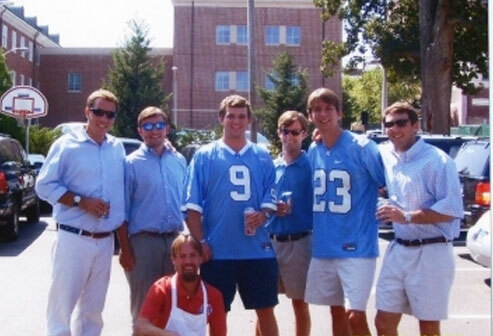 Beta Chapter of Phi Delta Theta at UNC - 4 Front Row UNC Basketball Tickets, Anyone? 4 Front Row UNC Basketball Tickets, Anyone? Did you catch this article in the newsletter? Don’t miss a chance to win four Carolina basketball seats for next season! We have essentially completed the NC Beta Capital Campaign to renovate and improve the fraternity house. With great support from the active brothers and alumni, we secured about $725,000 in total campaign contributions. Understandably, as we worked on various improvements, we felt the need to address almost any physical need now versus waiting five to 10 years down the road. We ended up spending about $820,000. We have a note for the shortfall with Wells Fargo bank. My offer to personally match any money received prior to January 2015 helped generate more gifts. Also, several classes teamed up to recognize deceased fraternity brothers. The classes of 1968-1971 raised a collective total of $103,050 to honor Gene Phipps ’69 and Bill Robbins ’70. A plaque in their honor will be placed in the house within the next several months. Wallace Graham ’61 also was very generous, and a plaque will honor his gift. It has been my joy to help make the Phi Delt house the most functional and physically impressive house on campus. Any visitor would say we were successful. The real benefits are not in a better party room, foyer, pool room, bathrooms, HVAC system and walk‑in cooler, but in the quality of young men pledging NC Beta. The classes of 1971-1976 are planning a big reunion at the house in early June with a buffet, music and more. I think we will see other classes reserving the house for special events going forward. Call me at 336-232-1905 or Bob Page ’52 at 919-937-4100 if we can help you plan a reunion at the house. There will be a small rental fee. In an effort to continue to raise funds toward our goal, I will give four Carolina basketball seats on the front row (next to the announcers) and a great parking pass for the 2015-16 season to the first person who sends $5,000 or more prior to May 1. Thank you for your support. We received gifts from over 435 alumni, parents and actives! If you have not given, we would love to receive a check payable to Beta Chapter of PDT, Inc. Send to my attention at PO Box 3288, Greensboro, NC 27402.